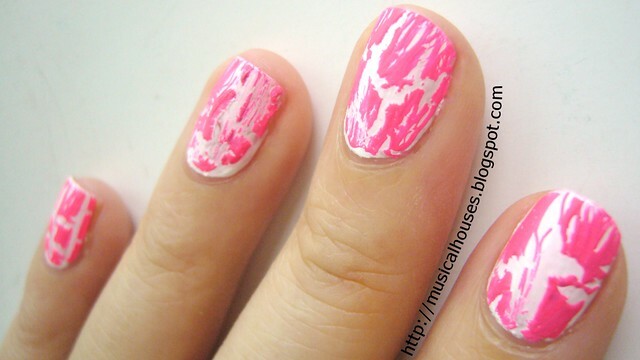 Nicki Minaj Super Bass Inspired Nails: White and Hot Pink Crackle! Say what you will about my music taste, but I gotta admit that Nicki Minaj single, Super Bass, sure is catchy. (I know the song isn't eactly new now, but believe it or not, I've listened to this song so many times that I can rap the entire song by heart! Who says nerdy Asian girls can't rap, huh?) I really like the video as well - so bright, colorful, and candy-like. I mean, just look at her outfit! This look is really simple to do, thanks to the awesomeness of shatter polish. Here I used Wet n'Wild White for the base, and over it I put BeautyUK's Shatter Polish in Punk. Punk is a bright neon pink, which I absolutely love - I don't think there's a shatter polish colour quite like it. I know Nicki Minaj's outfit is more animal print-ish than shatter polish, so I guess if you have a Konad plate that has a similar pattern it would probably work as well. But I don't, so I just cheated using my shatter polish. I know shatter polishes aren't quite the trend anymore, but on the occasion that I use one, it still makes me smile. And I was just inspired by Nicki Minaj's outfit to bring it out! Very pretty! That's a nice pink crackle! I still love the crackle polishes! This is a lovely idea! Might have to try it sometime! This is adorible. I never thought to do this look! Also, try a bright yellow under the pink, it looks like pink lemonaid! I love the pink and white combo! White and pink. Awesomeness !